Serene Firenze Recliner Chair .A very strong and extremely comfortable armchair that can fold compactly for easy transportation and storage. The Serene chair can recline into different positions making it perfect for relaxing after a busy day. Nice chairs but there are a few things that could have made it a great chair. Firstly, the chair arrives in a plastic bag (inside the box). A cover / bag would have been a nice cheap addition as the gunmetal paint can get scraped in transport / storage. Secondly, the chair moves back and forth with your seating position. However that does seem to make the only options upright or laid back. There doesnt seem to be any middle ground as you would have to balance yourself in that position. 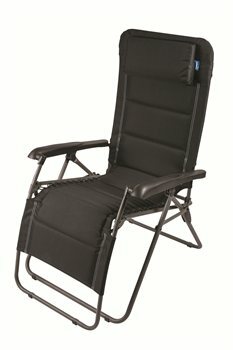 Friends on our camping trip had bought two similar versions elsewhere at the same price as one of ours and theres had a locking leaver that held the chair in your desired position so this would have been a good option to have had. Otherwise its a good camping chair. Well built and very comfortable.Its a bit wider than lower priced chairs so extra comfy and folds pretty flat for transporting.